The other day I was reading an article about how to tell if you are an amateur artist. It hit home for me, primarily around focus. I have a history of changing mediums and subject matter quite often. Last year it was portrait sculpture, the year before, relief printmaking. 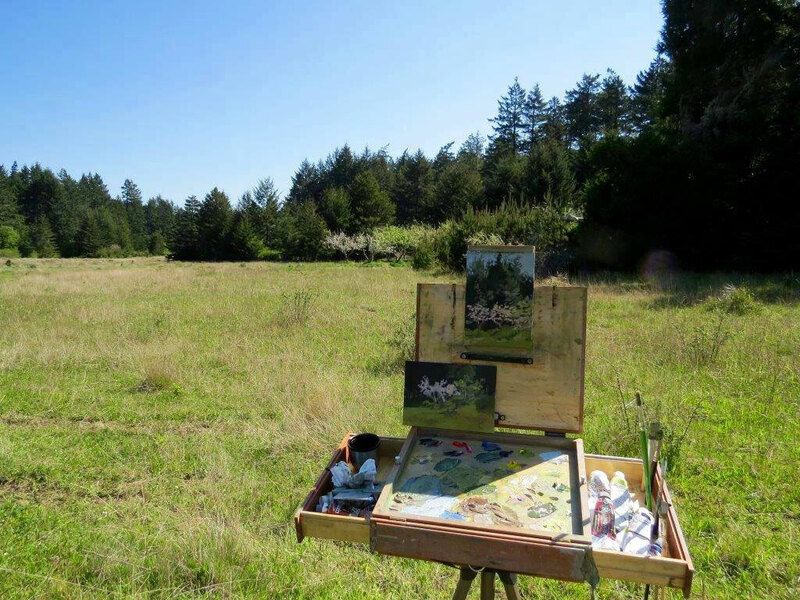 Now it is plein air and studio landscape painting. I have slipped in a few portraits recently. At least I’m sticking to painting. Andrew and I are all geared up for plein air painting and we both love it. It combines safe adventure and being outside together with making art. I’m not that good at it. Yet. I am committing myself to learn and enjoy this direction and to build a strong body of work around it. I want it to stick! I want to at least act like a professional artist. 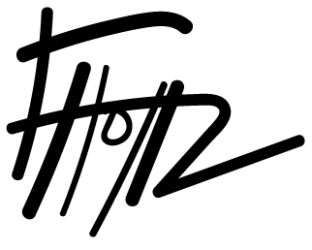 We want to make enough good work to have a show in a couple years while selling some work along the way. For me, it means not selling pieces which are my best at that moment, the pieces which have a seed of where I want my painting to be. So when I get there, the body of work will be strong and representative; loose, impressionistic, with true values, hard and soft edges, interesting light and engaging composition. 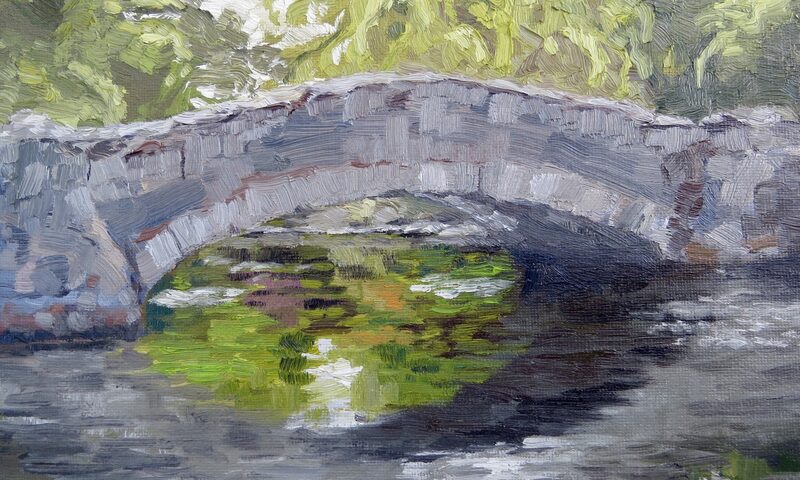 Every painting session is a step towards that goal and a re-commitment to staying the course. The summer season in Victoria and surrounding communities means ART! There are so many events and shows that it would be near-impossible to attend, let alone participate in everything. This is especially true for those of us who work full time. For me, the season starts off with a new little bang which may be the spark of an annual BIG show in Victoria. Art Now Victoria is the first juried show from the Community Arts Council of Greater Victoria. Two of my recent portrait paintings were juried into the show, so I’ll be at the opening night on Thursday, May 7 from 6:30 – 9pm. I haven’t seen the show yet and it will be very interesting to see the works selected by a seriously distinguished panel of jurors. Meanwhile back at home the painting continues. Andrew and I were up early this past weekend to visit Aylard Farm and Cattle Point for some gorgeous sunshine and reasonably successful paintings. We need to remind ourselves that we are still just learning when our results don’t match out intentions or hopes. Every time we paint we are a step closer to meeting our goals and expectations. Sunday’s session was especially enjoyable because we stood side-by-side to paint the same scene. We swapped advice and laughs while completing small 5″x7″ pieces. Coming up this summer is the renowned Sooke Fine Arts Show, the Moss St. Paint-in and a couple other smaller shows which I will detail as the dates crawl towards us. 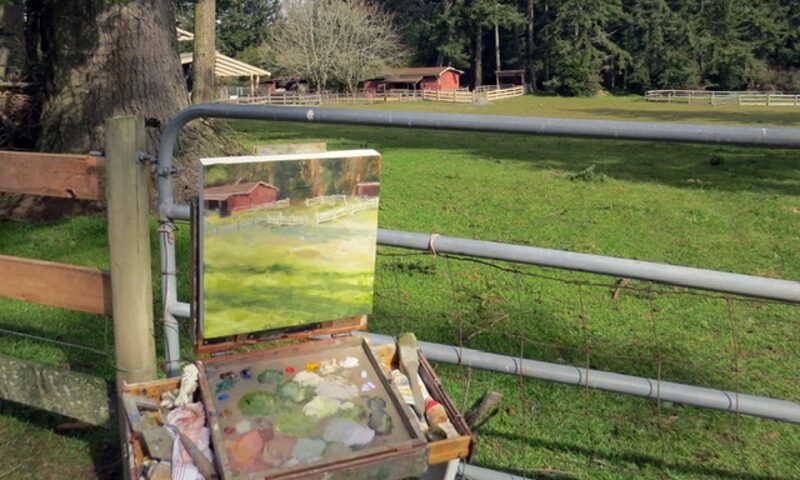 We also are attending a painting workshop with Teresa Oaxaca on Whidbey Island, have 3 weekends set aside to paint en plain air on the lawn of the Empress hotel and are going plein-air camping.I am still in the healing process with my back so down time between all these events will indeed be very low down. As in on the floor. Ha! I hope to see some of you out there in this busy and challenging summer!